RUSH: Hey, quick question for those of you just tuning in to the program today: How many of you saw Trump’s CPAC speech? He went about an hour and 20 minutes. It was very raucous. But how many of you saw it? I, of course, watched it here. And you know, folks, I have to tell you. It was so great — and there’s about a thousand of ’em in there. It was so great seeing a bunch of young people cheering the president at a conference instead of watching him on CNN. It was just so much more pleasant to watch — and the contrast! You go to Trump’s CPAC speech today, and all it was: Trump back on the campaign trail. It was a Trump rally, part of it teleprompter, most of it off the teleprompter. It was stream of consciousness. Whatever came to his mind, he spoke. He was ebullient, he was confident. He thoroughly enjoyed being there, didn’t want to stop — and then you contrast that with anything else that you see in the mainstream media today, and the contrast could not be more stark. Everywhere else in the Drive-By Media we have people that are doing nothing but promoting and promulgating anger, hate, rage, misery. And for some stupid reason, they think it’s infectious, and they think they can build a movement off of it. And they couldn’t be more wrong. And then, right opposite that was Trump and his audience at CPAC today. 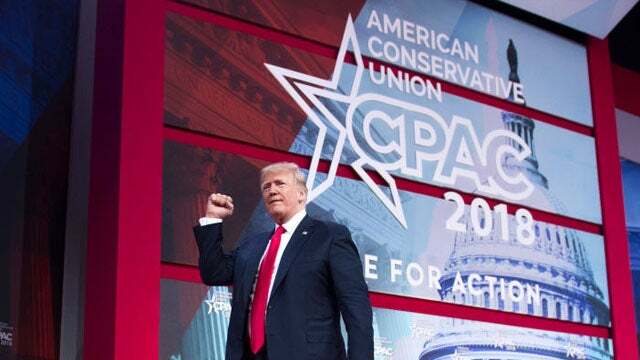 RUSH: Now, we’re gonna go to Trump’s sound bites from the CPAC speech today because he addressed this in a roundabout way. He addressed the midterm elections — and you know he did this, I think it was rather insightful and brilliant. To set this all up, Trump was in his element. He was at CPAC, and he was just loving every minute of it. This was the Donald Trump that we all saw during the campaign: The infectious and jocular candidate loving the entire life that he was living running for the presidency of the United States. He was feeding off the crowd. The crowd was in love with him. The bond that exists between Trump and his supporters was obvious in this speech. And Trump thus felt very confident, very comfortable. He was in his element, and it was one of the classic Trump performances. He was off the teleprompter for most of the speech, anyway, but even later into it, he said, “You know what? These teleprompter things, these written speeches, they get kind of boring. “So I’m gonna abandon teleprompter.” He’d abandoned the teleprompter in the first 10 minutes. He was winging it. There’s nobody in American politics who could do what Donald Trump did today. An hour and 20 minutes, and nobody wanted it to end. There are some people in the media who could do that. Very few. But there’s nobody in politics who could. There’s not a single person in politics who could do what Donald Trump did today. If any of ’em tried it, there would have been boos and shouts for somebody to grab the hook after the first 25 minutes. After the first 25 minutes, Trump was just getting warmed up. So let us start with the audio sound bites of Trump, and they’re not in any particular order here. This is where Trump says he’s gonna reverse the trend of presidents losing in the midterm elections. THE PRESIDENT: We didn’t have one Democrat vote, and I think that’s gonna cost them in the midterms. I know that whoever wins the presidency has a disadvantage for whatever reason in the midterms. You know what happens? Historically, if you win the presidency, you don’t do well two years later. And you know what? We can’t let that happen. Nobody’s been able to explain it. It just happens statistically almost all of the time for many years. What happens is you fight so hard to win the presidency. You fight, fight, fight, and now only two years… That’s a very short period. We just won the presidency and then we get clobbered, and we can’t let that happen. RUSH: I am so glad he brought this up. I am so glad he addressed this. I have never seen… I’m sure other politicians have. I’ve never… I don’t recall it. I mean, I can remember campaigns mentioning, “Hey, you know, we’re supposed to lose here in midterms. We need you to get out there and really make phone calls. We need you to knock on doors. We need you to pass out the bumper stickers!” But here’s Trump making a personal appeal to the people who elected him. Now, I think that there is a lot of credence to what he said. There’s credence to the fact that there’s an energy drop, there’s an adrenaline drop-off. The election happens, and you win, and so it’s time to exhale, maybe celebrate a little bit. But there are other factors here. And it is true. The standard operating procedure… Well, it’s not really a procedure. The pattern is that the party out of power, in this case the Democrats, always does gain seats in the House. Sometimes the Senate, although this year it’s tougher for the Democrats, they got so many to defend. But they generally do gain seats. It’s not just because people have run out of energy. It’s because there’s always a little bit of a letdown. There always… You know, not everybody that votes for a president is a 100% into that guy. Some people vote for president ’cause they hate the other person, but they’re not particularly crazy about the person they vote for. Then you have the opposition, the losers. They have not lost their adrenaline. They are more energized than ever because they are a combination of angry and scared. They’re insane to begin with, as typified by CNN. They’re literally off their rockers, they’re wacko over the fact that they lost in the first place in 2016. So they are loaded for bear, and their voters are likewise energized. Because they think they got cheated. They think the Russians stole the election — and they really do. They are that dumb. They are that stupid. And, by the way, this is a change of view for me. Many of you who have been here from the outset might recall something. In the early years of this program, maybe for the first 10, when I would have callers reach me and start insulting the intelligence of average Americans based on the way people were reacting to things in the news, I always cautioned them to pull back. I always said, “The American people are not stupid. The American people are not — as a rule — intellectually inferior. They’re not dumb. They may be ignorant.” I have revised this. There is wanton, blatant stupidity, and it is everywhere out there — and it’s a combination of ignorance and stupidity and how propagandized they have been. They have been propagandized. They have been — literally have been — programmed to hate. On the left, there is an absence of any curiosity. There is no real desire to learn if they are wrong so that they can be correct. The idea being wrong never occurs to them. So we are… We’re in the midst of a significant portion of our country which has indeed been dumbed down. They have been propagandized. They have been conditioned. There’s a story out of Seattle… Let me see if I can find this here at the bottom of the Stack. Very, very, very quickly here. Hang on. Be patient with me, here. I put it at the bottom of the Stack, ’cause it’s not a big Stack today but I was gonna get to it anyway. Well, it’s in this Stack, damn it, and I can’t find it right off the beaten path. Here. The bottom line is that somebody in Seattle was looking out his window and got outraged. He saw what he thought was the Confederate flag and he started calling everybody and whining and bitching and moaning about it. He was very mad! He was demanding that somebody take it down. Abject dumbness, unhinged stupidity. A programmed, propagandized liberal, left-wing population. They are loaded for bear, because they think the election was stolen from ’em. They think Trump cheated. They think Trump to this day is still working with Putin and the Russians, and can you blame ’em if they watch CNN or the New York Times or the Washington Post or watch anything else? That’s what they’re being told each and every day! So I’m glad the president took this on, because it can be overcome. It can be overmatched. We can outnumber them and overmatch them. But our side’s going to have to be energized like nothing happened in 2016. Trump is right about that.